Blast away! Length is your friend on this hole, and, as long as you’re in play, hitting this green in two is possible. The green is slightly elevated and gives a fair test to your chipping and putting abilities, with very little trouble surrounding the green. This hole is all about picking the correct club. An elevated green with two main tiers makes accuracy a premium. Coming up short and to the left puts water and bunkers into play, and over the back is a ball-hungry bunker. Middle-right is the safest play. Known as "The Gambler," this is the ultimate risk/reward hole. The risk is the water on the right and the front bunker on the left. A fade that hits the green will probably go into the water. Anything to the left of the green will end up in the collection area or trundle off to the right. Long and to the left or 120-yards short are your safest shots. This hole is all about the fairway. The water on the right is reachable and there are trees and thick rough on either side. 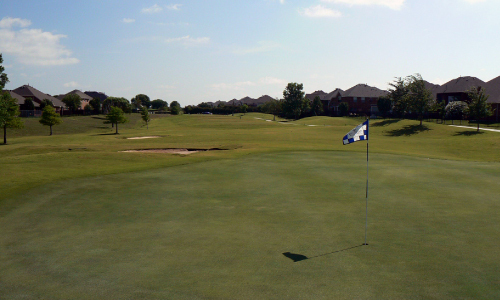 This is a deep green, so pay careful attention to the pin location to avoid a very long putt. Pull out your driver and go for it on the shortest par 4 on the course. Position yourself to the left-center of the fairway to avoid bunkers on the right. The green is elevated so club selection for your approach is key. Beware of the bunkers on this hole, as they are most definitely “in play.” If you keep it down the middle and pay attention to your pin location, you might make birdie on this short par 4. Known as "The Humbler," our signature hole plays long even when the wind isn’t blowing. If you hit the ball long enough, avoid sand and water to your left. If you hit short, watch out for the water. If you think you have to hit a driver, you probably do! Finally, a hole that lets you hit any-shaped tee shot as long as you aim accordingly and avoid the big bunker on the right. The only hazards on your approach are one bunker short right and another bunker long left. Long hitters can go for the green. If you keep your tee shot in the fairway, then you’ll be set up for a two-putt par. A bunker strategically placed to the right of the fairway catches many balls. Keeping two shots in the fairway goes a long way towards hitting the green in regulation on the longest hole of the course. Pay attention to pin location because the large, two-tiered green slopes to the front. The bunkering on the right dashes many golfers’ hope for par on this deceptively difficult hole. The bailout is long left into the collection area behind the green. A fairly flat putting surface makes for an easy two-putt. A long wayward tee shot may exact a difficult second on this mid-length par 4 as the fairway narrows significantly past the 150-yard marker. The safest tee shot is down the middle, landing just short of the bunker right of the fairway, which leaves a mid-iron onto this mostly flat green. Stay away from bunkers on either side of the fairway on this short par 4. A well-struck drive leaves you with a short iron second shot. The right side the green is shallower than it appears, which brings the front bunker into play on shots that come up short on that side. If you are long enough to carry the bunker on the right, then blast away at this sleeper par 5. Otherwise, line up your shot to avoid this ball grabber. Only the long and accurate make the green in two. The green is elevated and can play one or two clubs longer than indicated by the yardage. This long par 4 usually plays into the prevailing wind. You might be tempted to hit a wind-cheating hook, but keep in mind that fine players have lost their tee shot to the water on the left. This hole puts a premium on your approach and tee shot. If you get to the green in two on this par four, count yourself among the few. Hit it straight and pay attention to the pin location. Watch your approach to this two-tiered undulating green that slopes mostly to the front. Being on the correct tier will make or break you on this hole. With water on both sides of the green, this is the toughest approach shot on the course. Leaving your ball to the center-right of the fairway gives you a strategic advantage from the tee box to set up a good angle to the green and keep your ball away from the many trees. 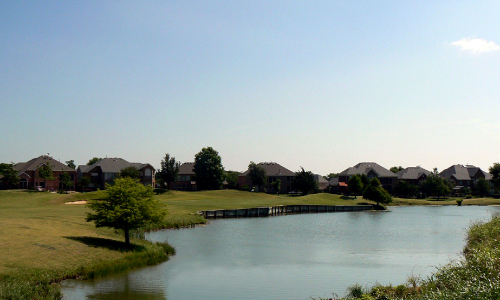 Caution: more balls are put in the pond to the right of this green than in any other at Waterview Golf Club. Tee times may be made up to 7 days in advance. When you call to make your reservation, our staff will ask the number of players in your group and the day and time you would like to play. We will do our best to accommodate you. We will require a phone number, and on weekends, a credit card number to reserve the time. 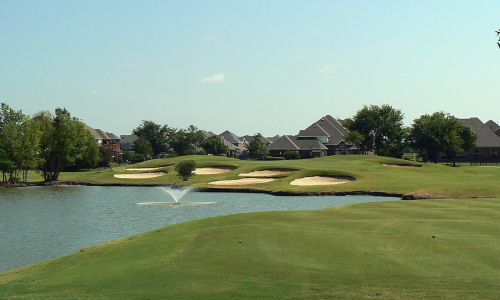 Designed by David Graham in 2000 and conveniently located less than 30 minutes north of downtown Dallas, Waterview Golf Club features championship play set amidst rolling pastures and bountiful lakes. The professional tees play long at 7,191 yards and a slope rating of 131 keeps it challenging. Water comes into play on 10 different holes, including the signature hole, a demanding 235-yard, par 3 which requires a shot over a lake that wraps around the left side of the green. With 419 Bermuda fairways and Bentgrass greens lined with 18 different species of trees, Waterview Golf Club is an unbeatable golfing destination. (972) 463-8900 or click here.